This entry was posted in Lower Cartilage Piercings, Piercing Portfolio, Top Ear / Rim Cartilage Piercings and tagged 2017, 2nd Skin, 2nd Skin Piercings, Bexley, Body Jewellery, Body Modification, Body Piercer, Body Piercing, DA16 3QS, Ear Rim Cartilage Piercings, Ear Rim Wrap, El Capitan, Helix Piercings, Kent, Lower Cartilage Piercings, New Studio, Piercing Portfolio, Piercings On Fridays, South East, Spring 2017, Titanium, Top Ear / Rim Cartilage Piercings, Welling. Bookmark the permalink. The lovely Chloe’s triple helix piercings all pierced w/1.2mm x 8mm titanium labret bars. The top two are around 2-3 months into healing whilst the third/lowest has just been added at the time of the pictures. Always a pleasure to meet so many wonderful people and we were both real happy with how this classy triple cluster turned out. This entry was posted in Lower Cartilage Piercings, Piercing Portfolio, Top Ear / Rim Cartilage Piercings and tagged Body Jewellery, Body Modification, Body Mods, Body Piercer, Body Piercing, Ear Piercing, Ear Piercings, El Capitan, Greenwich, Helix Piercings, London, London Body Piercing, London Piercer, London Piercing, London Town, Lower Cartilage Piercings, Piercing Portfolio, SE10, Shiva Piercings, South East, South East London, South London, Titanium, Top Ear / Rim Cartilage Piercings, Triple Cluster Piercings, Triple Helix, Triple Helix Piercings, Triple Pierced, Triple Piercing Clusters, Triple Piercings, UK Body Piercing, UK Piercer, UK Piercing. Bookmark the permalink. Always a pleasure to pierce the many regulars @ Shiva, here’s Hannah’s various ear work. A healed top-ear/helix w/0.8mm x 8mm seamless (continuous) stainless steel ring and a couple of fresh double helix piercings w/1.2mm x 8mm titanium bars. Also a couple of awesome contrasting shots of Hannah’s ‘ghost’ plug which I think is currently 14mm. This entry was posted in Lower Cartilage Piercings, Piercing Portfolio, Stretching & Tapering, Top Ear / Rim Cartilage Piercings and tagged Body Modification, Body Mods, Body Piercer, Body Piercing, Cartilage Piercings, Ear Piercings, El Capitan, Greenwich, Helix Piercings, London, London Body Piercing, London Piercer, London Piercing, Lower Cartilage Piercings, Piercing Portfolio, Plug, SE10, Shiva Piercings, South East, South East London, South London Piercing, Stretch, Stretched Ear Lobe, Stretching & Tapering, Top Ear / Rim Cartilage Piercings, UK Body Piercing, UK Piercer, UK Piercing. Bookmark the permalink. Faith’s double helix piercings almost five years apart! The top/higher one has long healed and been fit with a BCR. The new addition, midway has just been pierced w/1.2mm titanium labret bar. Always a pleasure to see faces old and new, in the studio. This entry was posted in Lower Cartilage Piercings, Piercing Portfolio, Top Ear / Rim Cartilage Piercings and tagged Body Mods, Body Piercer, Body Piercing, Ear Cartilage, El Capitan, Fresh, Greenwich, Healed, Helix, Helix Piercing, Helix Piercings, London, Lower Cartilage Piercings, Piercing Portfolio, Piercings, SE10, Shiva Heads, Shiva Piercings, Titanium, Top Ear / Rim Cartilage Piercings. Bookmark the permalink. Ashleigh’s lower/mid-ear cartilage piercing w/1.2mm x 8mm titanium bar by El Capitan @ Shiva Piercings. 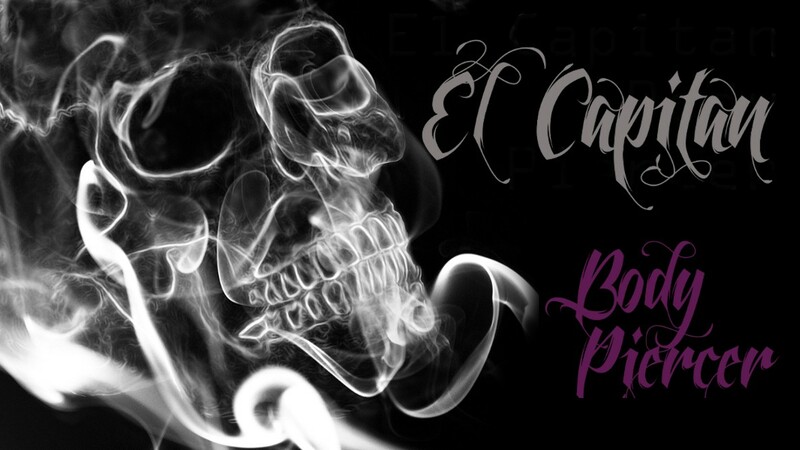 This entry was posted in Lower Cartilage Piercings, Piercing Portfolio and tagged Body Piercer, El Capitan, Greenwich, London, Lower Cartilage Piercings, Piercing Portfolio, SE10, Shiva Piercings. Bookmark the permalink. B’s lower ear cartilage (helix/mid-ear/rim) and second lobe piercing by El Capitan @ Shiva Piercings. 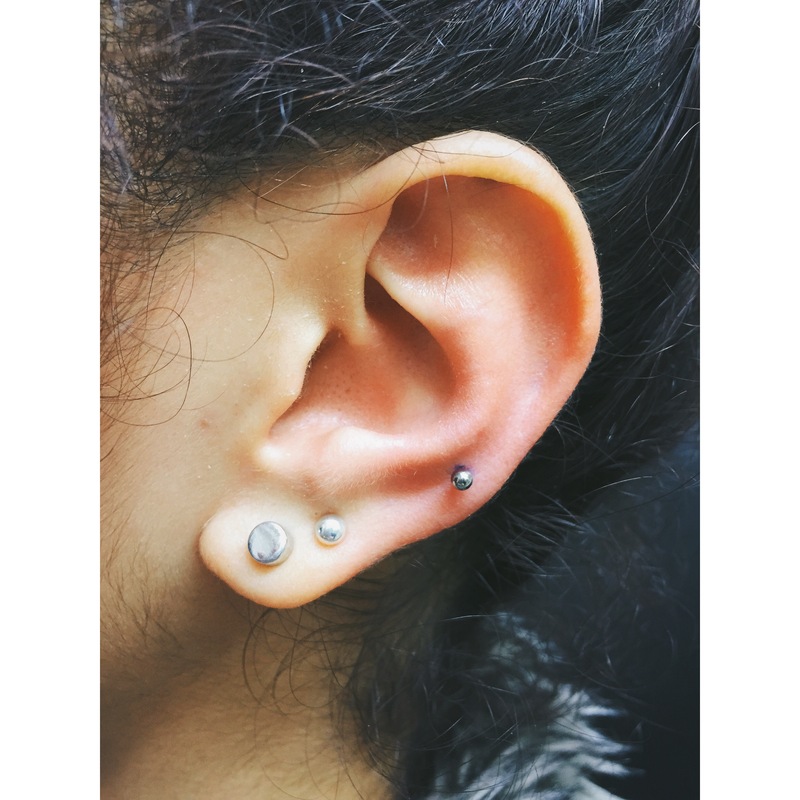 This entry was posted in Lobe Piercings, Lower Cartilage Piercings, Piercing Portfolio and tagged Body Piercer, El Capitan, Greenwich, Helix Piercing, Lobe Piercings, London, Lower Cartilage Piercings, Mid Ear Cartilage, Piercing Portfolio, SE10. Bookmark the permalink. Here’s Sophia’s well-pierced ear with two additions by myself. Sophia came in with her existing lobes, conch, scaffold and the top of the helix trio already pierced on her left ear. 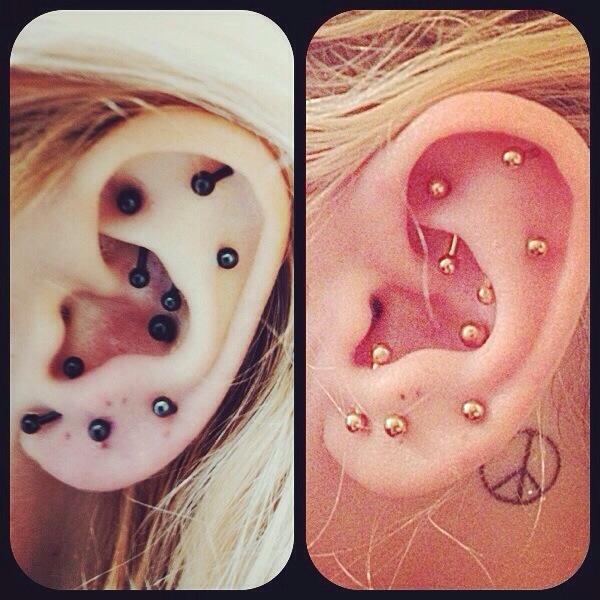 She requested two lower cartilage piercings to create a curving trio, a triple helix/ear cartilage piercings. The two lower ones, were pierced by myself w/1.2mm x 8mm (lower) & 10mm (middle) titanium jewellery to allow for swelling. Happy to add to this collection. 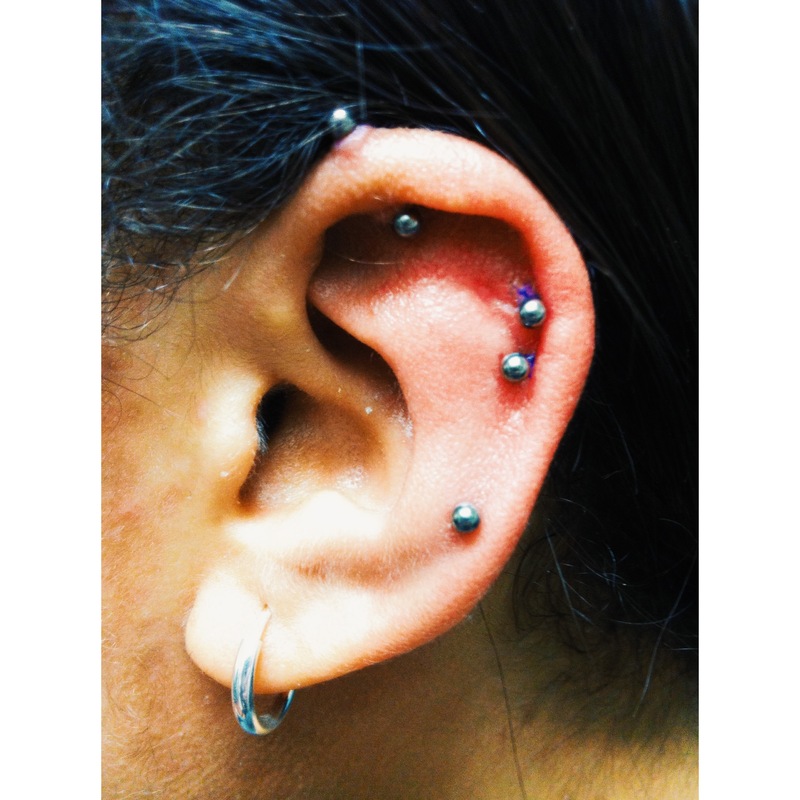 This entry was posted in Lower Cartilage Piercings, Piercing Portfolio, Top Ear / Rim Cartilage Piercings and tagged Body Piercer, Double Helix, El Capitan, Greenwich, London, Lower Cartilage Piercings, Piercing Portfolio, SE10, Titanium, Top Ear / Rim Cartilage Piercings. Bookmark the permalink. Katrin’s double helix/ear cartilage piercings, pierced w/1.2mm x 8mm titanium by El Capitan @ Shiva Piercings. This entry was posted in Lower Cartilage Piercings, Piercing Portfolio and tagged Body Piercer, Double Helix, Double Piercings, El Capitan, Greenwich, London, Lower Cartilage Piercings, Piercing Portfolio, SE10, Shiva Piercings. Bookmark the permalink. Serena came to see me with a logistically defying gun pierced scaffold… I cannot stress anymore how important it is to pierce needle only, an industrial with a gun is just horrific. You can see on the top of the ear where the former scaffold was, how blown out the ear has become and the angle was a) so off, and b) the lower ear rim just wasn’t possible to pierce in that way. That (shorter) bar (I replaced the scaffold with) is in line with the lower two of the top two I added/rather than in line with the top! Yet the scar is in line with the top bar… The ear had got so angry that a whole half of the scaffold bar had submerged and looked as though it was going through the actual ear. Up on my advice and me removing the bar, Serena treated her ear to a point it was way healthier and pierceable in a professional and safe manner. I first pierced the lower part of the ear cartilage and several weeks later added the two top additions. Pierced w/1.2mm x 8mm titanium only bars. Needle only piercings. Safe to say Serena has been back since and is healing well to my knowledge. 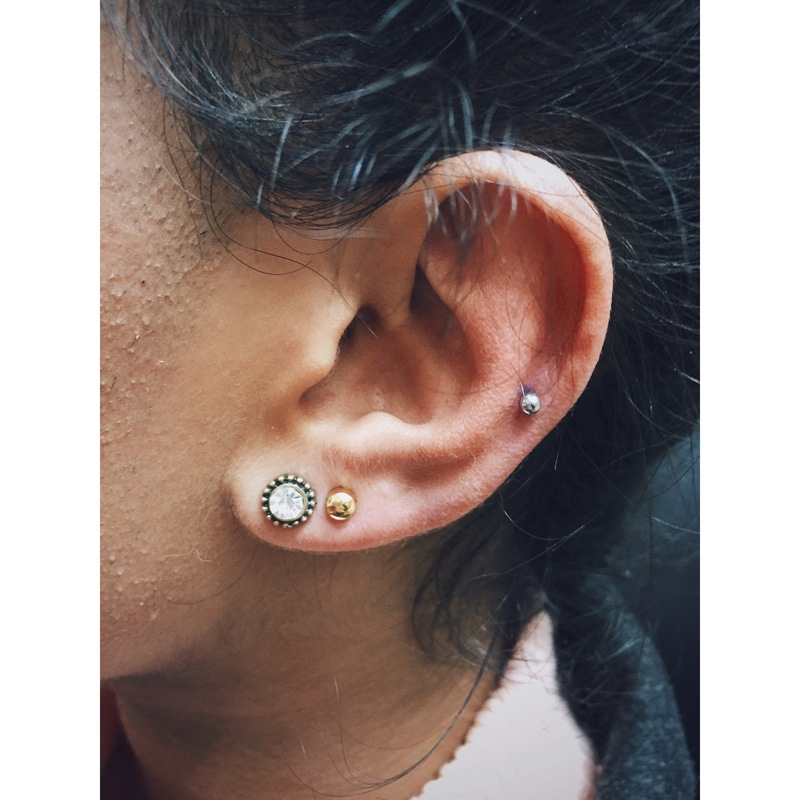 This entry was posted in Lower Cartilage Piercings, Piercing Portfolio, Top Ear / Rim Cartilage Piercings and tagged Body Piercer, Ear Cartilage, El Capitan, Greenwich, London, Lower Cartilage Piercings, Piercing Portfolio, Piercings, SE10, Shiva Piercings, Top Ear / Rim Cartilage Piercings. Bookmark the permalink. We sell a wide range of jewellery @ Shiva and I’m more than happy to pierce w/blackline or sun-coat gold titanium, as modeled by Kelly; who has various ear piercings pierced by myself. 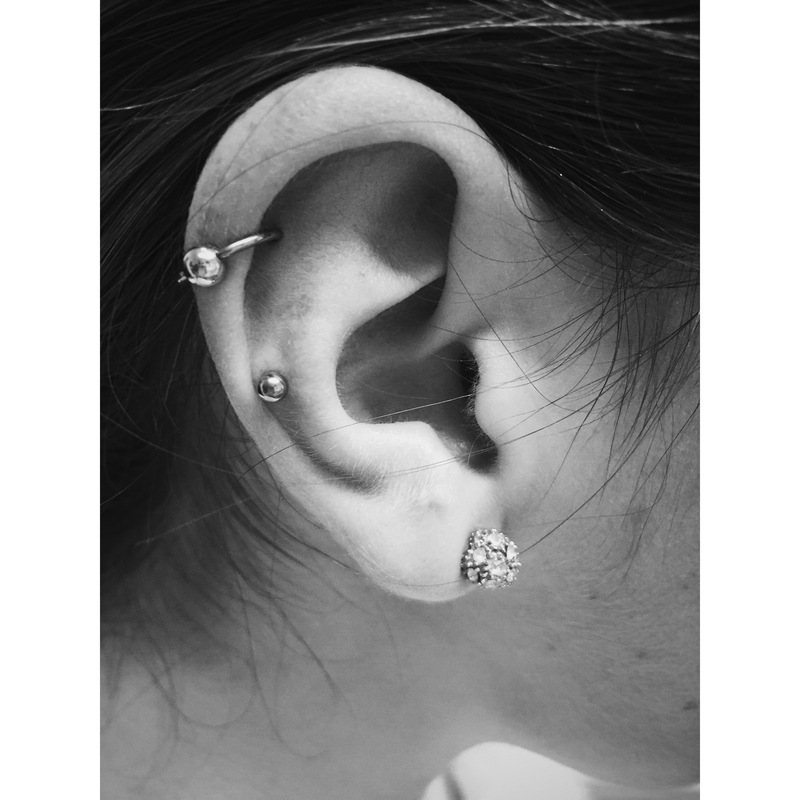 This entry was posted in Anti-Tragus Piercing, Conch Piercing, Lobe Piercings, Lower Cartilage Piercings, Piercing Portfolio, Top Ear / Rim Cartilage Piercings and tagged Anti-Tragus Piercings, Black, Blackline, Body Piercer, Cartilage, Conch Piercings, Ear Work, El Capitan, Gold, Greenwich, Lobe Piercings, London, Lower Cartilage Piercings, Piercing Portfolio, Piercings, SE10, Shiva, Shiva Piercings, Sun Coat, Sun Kissed, Top Ear / Rim Cartilage Piercings, Various. Bookmark the permalink.